Greg Olsen bounced back and without disappointment Gronk continued to deliver. Week 2 answered questions but posed new ones. Will Delanie Walker return from his sprained wrist? Will Jason Witten's value take a hit without Tony Romo under center? Will Julius Thomas continue to be limited in practice thereby keeping him out of games? We'll look to sort things out in our week 3 tight end rankings. Note, an asterisk (*) next to a player's name denotes a possible injury concern for that player as we approach week 3. 1. Rob Gronkowski vs JAX - The Gronk train rolls on to face Jacksonville. Gronk is the top tight end until he simply can't suit up for a game. He put up a 7/113/1 line against the Bills despite facing extra attention from Rex Ryan's defense. Additionally, he was occasionally shadowed by Buffalo's top cover man Stephon Gilmore, making his day even more impressive. 2. Jimmy Graham vs CHI- Graham had a dud of a game against the Packers on Sunday night, but the Seahawks, as a whole, were off most of the night. Expect a bounce-back game against the Bears. 3. Greg Olsen vs NO- Olsen showed his true colors with a 6-70 line against Houston on Sunday. Owners would like to see him in the end zone, which could certainly happen against the inept Saints. 4. 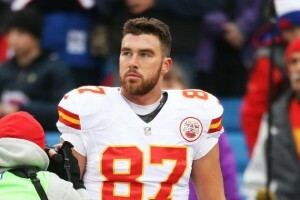 Travis Kelce @ GB- Kelce has been en fuego, and although he faces a defense which just held Jimmy Graham to 1 catch for 11 yards, he remains a quality option as a target monster and major part of the Chiefs' plodding passing "attack." 5. Jordan Reed* @ NYG- We love Reed this week, though he continues to battle a quad injury as he enters a short week. Reed went for 6 catches and 82 yards against the Rams on Sunday. He'll hope to have a big day against a Giants' defense which has seen Jason Witten and Jacob Tamme have nice games. Travis Kelce remains an elite tight end play in week 3. 6. Tyler Eifert @ BAL- Healthy and off to a terrific start. 7. Jason Witten* vs ATL- Takes a bit of a hit without Tony Romo, but still an elite play. Enters week 3 with a minor ankle injury. 8. Martellus Bennett @ SEA- Like Witten, takes a hit without his starting quarterback, Jay Cutler. Jimmy Claussen should still look to get him the ball often, especially if Alshon Jeffery (calf) can not go. 9. Ladarius Green @ MIN- He'll continue to see targets while Antonio Gates serves his suspension. 10. Kyle Rudolph vs SD- Like Eifert, health is key here. Budding rapport with Teddy Bridgewater. -Jacob Tamme can benefit from extra attention headed Julio Jones' way. -Richard Rodgers is gaining steam, and could play a bigger role if Davante Adams(ankle) is limited this week. - Is this the week Josh Hill steps up in New Orleans? The Saints are badly in need of some red zone help. - Brandon Myers looks likely to slot in for Austin Seferian-Jenkins (shoulder) in Tampa Bay. Myers had a 79/806/4 line in Oakland three years ago, and should catch some passes from Jameis Winston while AS-J sits for 4-6 weeks. Best of luck to all in week 3.